After a slow and uncertain beginning, 3D has now taken hold as a standard feature for premium entertainment. Purchase a £999 TV and, more likely than not, it will have some 3D trickery. Watch any Hollywood blockbuster film and, again, chances are that it will be presented in 3D. As you may know, NVIDIA has been pushing 3D for its PC-based GeForce graphics cards for a while now. Outputted to an external display - either a TV or computer monitor - the company has worked hard with games developers to ensure that some of the latest titles offer compelling reasons to go down the 3D Vision route. AMD, too, has cottoned-on to the fact that, whether you like it or not, 3D is here to stay. As such it has launched a similar program, dubbed HD3D, aimed at enabling users to run games and applications with 3D very much in mind. Speaking from a PC viewpoint, one needs a 3D-capable graphics card, monitor, glasses and content. Now, 3D monitors are available in a wide variety of sizes and specifications. Complicating matter somewhat, you need to know which screen/glasses combinations works with a certain company's hardware. Samsung has an array of 3D-compatible TVs and has steadily been building up an arsenal of 3D computer monitors. The latest to grace the line-up is the svelte, aesthetically-pleasing SA950, which is better known as a 27in, full-HD screen with a built-in '3D convertor'. The snag is the price, as it retails for £500-plus, so let's see if it's worth it. If awards were given out for aesthetic elegance then the Samsung SA950 would walk away with top honours. Featuring a super-thin bezel and connected to the base by a curved arm on the right-hand side, there's little not to like here. 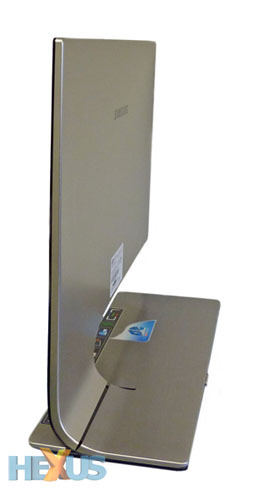 While there's understandably no height adjustment available, the panel can be tilted back from vertical by around 20° by pressing on the stand immediately behind the arm. The monitor arrives fully assembled, so there's no need to bust out the handyman screwdriver. The minimalist theme is helped by having touchscreen controls near the arm, and these only light up once the screen is active. Be warned, though, the plastic front is very reflective, meaning smudges and light sources show up very easily. The 27in screen, based on a 120Hz TN panel, also has a highly reflective coating that can seem almost mirror-like. 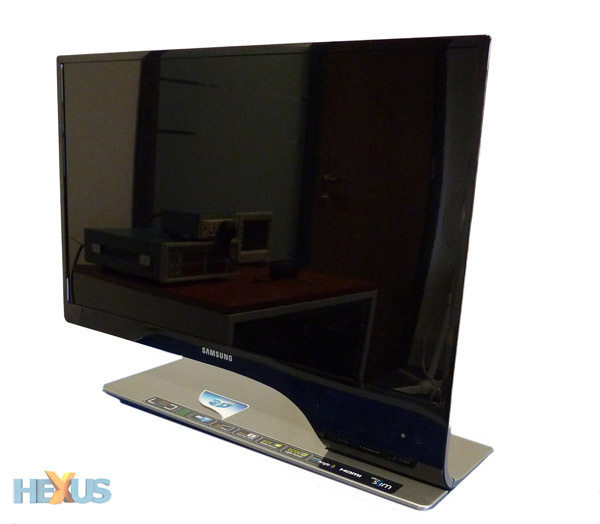 Flick it around and you can see how Samsung has managed to keep such sleek lines: the digital inputs - HDMI v1.4, DVI, and DisplayPort - plug into the base rather than the screen itself. The power-supply takes the form of an external brick, helping keep the base's thickness to just under an inch. Hewn from brushed aluminium on this side, the SA950 looks decidedly delicious from every angle. Should you so wish, the two main stickers can be removed easily enough. And while the overall footprint is quite large, given the size of the base, LED lighting enables Samsung to shoehorn a thin panel and associated circuitry into the SA950. 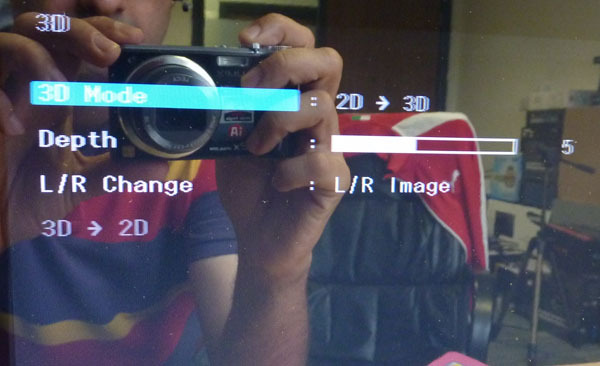 The 3D part of the screen's specifications emanates from the 120Hz display and supplied pair of active-shutter glasses. Rather than recharge via USB, the lightweight set uses a ubiquitous lithium battery (CR2032) that's reckoned to be good for 70 hours of continuous usage. Mating the glasses with the screen is easy enough. Simply hold them close to the monitor and switch on from the right-hand side. An on-screen graphic lets you know the process is complete, which only happens once the screen is in 3D mode, and a wireless link is established over Bluetooth, good for coverage up to 10m. Intelligently, the glasses power-down if the SA950's in 2D mode - you don't need 'em. Limited to processing at 60Hz per eye, there's inevitable flicker once the 3D mode has been turned on. You get used to it quickly enough, as per NVIDIA's glasses, but it can be distracting for first-time wearers. The screen is bright and clear, though viewing angles aren't the best we've seen. Blacks are deep and vibrant, helped somewhat by the reflective screen, and the colour is consistent from edge to edge. There's plenty of adjustment available through the touchscreen controls to make it suit your eye, yet the default settings remains a pretty good starting point. 2D quality is, subjectively speaking, excellent, with pin-sharp text, clean colours and crisp images. However, as noted earlier, the overly-reflective screen may be a distraction for most folk. We've shown a worst-case reflection scenario in the picture, above, though it's still visible (and distracting) with the monitor switched on. 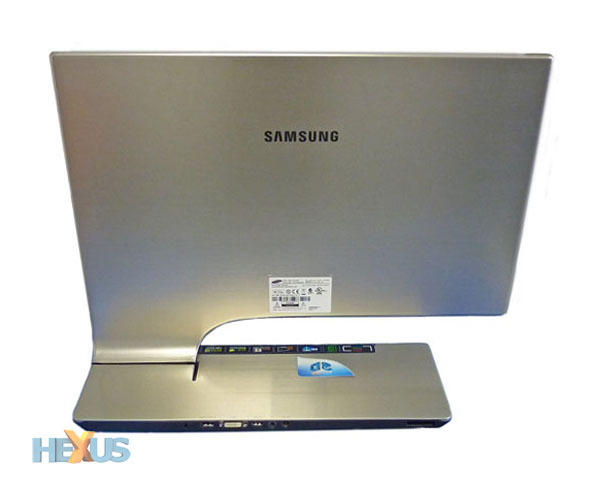 But 3D qualification requires more than just a nice-looking screen, and Samsung approaches it for PCs in two ways. First off, there's support for both AMD and NVIDIA graphics cards via middleware software technology from TriDef. AMD Radeon HD 5000-series, or later, GPUs can run sequential frames - that is, the full-HD resolution at 120Hz - while earlier AMD GPUs and all NVIDIA cards are supported in a side-by-side format and at 60Hz, leading to a halving of the screen resolution to each eye. The method by which the SA950 glasses support active-shutter technology precludes the use of the NVIDIA's proprietary 3D Vision glasses, which is a shame, and the TriDef software automatically disables any Vision drivers that may be installed on the system. Speaking of TriDef, the program, or game launcher, has up-to-date (3D) profiles for around 400 games, including most triple-A titles. A generic, non-optimised profile can be loaded if the game isn't supported directly. Samsung's ace-in-the-hole is some nifty display-side technology that automatically converts all content into 3D. Made possible by simply clicking on the screen's menu button and selecting 3D, the SA950 loads a generic three-dimensional setting for pictures, videos and games. Remember, this form of 3D is GPU-agnostic; it doesn't matter which graphics card is in the PC.